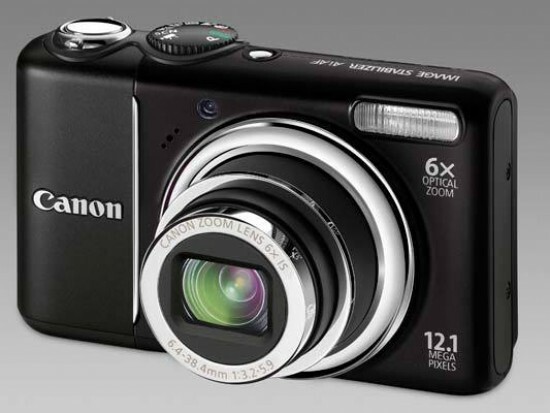 The Canon Powershot A2100 IS builds on the key strengths of the previous A2000 model by adding even more beginner-friendly features. The A2100 is a fairly compact camera that produces excellent images in good light, covers a large focal range thanks to the 6x zoom lens, and has a massive 3 inch LCD screen on the back that can be easily viewed from a wide angle. The wealth of different scene modes on offer are now accompanied by the ultimate point-and-shoot Smart Auto and Easy modes, which really do take the guesswork out of using the A2100 and make it suitable for all the family. Other beginner-friendly features include Face Select & Track, which is a great way of focusing on who really matters in your photos, and FaceSelf-Timer which easily allows you to take part in those all-important family group shots. The move to more megapixels - up to 12.1 from the A2000's 10 - thankfully hasn't come at the cost of image quality, although the A2100 still suffers from less than stellar images in low-light due to obvious noise appearing at ISO 400 and faster. Other key disappointments include the continued lack of any hand-grip which makes it difficult to hold, and an even slower continuous shooting speed of 1.1fps - thankfully the annoyingly slow flash-recycle time of the A2000 has been slightly improved on this model. Disappointingly for UK buyers, the launch price has shot up from £199 to £249, although to be fair to Canon comparable price rises are happening across the industry as Sterling struggles against the Yen. Overall the Canon Powershot A2100 IS adds a number of improvements to an already solid and easy-to-use design, making it even more ideally suited to its family target audience.